The METEOR 1700C is a high-powered C-Band weather radar designed for precise weather detection and warning in clutter-polluted environments. The sophisticated system features a fully coherent 250 kW klystron transmitter to deliver excellent data quality and maximum clutter suppression. This is particularly important for close-to-ground observations required by airport users. The METEOR 1700S is a high-powered S-Band weather radar system. 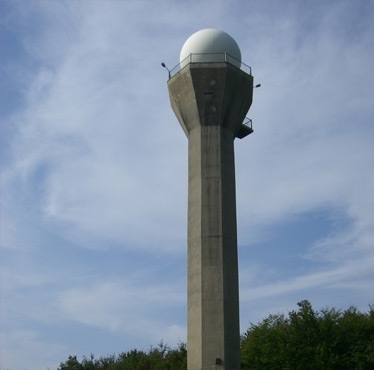 It was designed to be employed in severe weather regions, where attenuation by intervening heavy rainfall impedes the precise measurement of precipitation at long ranges. The sophisticated system features a fully coherent 750 kW klystron transmitter to deliver accurate data and maximum clutter suppression. The METEOR 1700C and METEOR 1700C are supplied with GDRX® and Rainbow® software for the precise detection and tracking of thunderstorms, wind shear, gust fronts and other severe weather phenomena at medium ranges. Both radars are available with single or dual polarization. The dual polarization option enhances the measurement of precipitation intensity and makes way for the categorization of different types of hydrometeors such as drizzle, rain, hail and snow. Dual polarization also enables the identification of non-meteorological targets like birds and insects, which can be hazardous to aircraft. Many country have bought these radars. Canada have made the largest order of weather radars in the history of Selex in buying 23 METEOR 1700S, and a certain number of options.